Note from shop owner Hey Goddesses! I'm focusing on another career right now so I'm not able to focus on Pineal Vision Jewelry fully at the moment. Will probably be back open at a later date! Hey Goddesses! I'm focusing on another career right now so I'm not able to focus on Pineal Vision Jewelry fully at the moment. Will probably be back open at a later date! As a disclaimer, I feel I should say that this review doesn't reflect the specific item itself but rather the shop owner. If I could leave this shop no stars, I would. I ordered these earrings on March 5th. I received them on March 22nd, a week or so later than I should have. When I opened my package, I realized I was sent a ring, not earrings. I contacted the shop owner and received a return shipping label from them and explained I would send back the item and I simply wanted a refund. I shipped the ring back to the seller, messaged them, and was met with silence. I STILL have not heard back from the seller as of April 1, 2019. And after having to escalate my case through Etsy this morning as well as PayPal, I finally received my refund. I would highly caution anyone who plans to purchase from this shop in the future. Beautifully crafted, delicate and light, yet strong enough to endure daily wear. Love this ring. Great product. Did take a while to ship but was worth the wait. Embrace your inner Goddess Warrior with the new Seeker Hoops! Perfect gift for your artsy sister! Only $20! Pineal Vision Jewelry has a mission to help women find and embrace her own inner Goddess. Pineal Vision Jewelry was founded by myself, Brittany Witt, after quitting every 9-5 job I’ve had in search of freedom to do what I love. But it’s not just that, I was dissatisfied with the mindless shopping myself and other’s around me were partaking in. I wanted to create something with meaning. On a mission to fulfill my creative spirit I went on to build a jewelry brand that catered to spiritual, conscious and creative women. Named after a spiritual awakening, Pineal Vision Jewelry opened its virtual doors on New Year's Day 2015. Fun fact, many believe that your pineal gland (a tiny pine cone shaped gland in the exact geometric center of your brain) is responsible for producing your mind's eye. My business name, Pineal Vision Jewelry, is an ode to my third eye and the creative vision that comes from deep within. My customers, a.k.a. Goddess Tribe, are free-spirited women who want to express their inner Goddess Power. She has a sense of wanderlust and magic about what she wears, and although fashion is important to her, she likes to go against the grain of what “Fast Fashion” says she should wear. Pineal Vision Jewelry offers her a gateway to discovering who she always knew she was - a true modern-day Goddess. Talismans that allow her to honor her symbols of life. My jewelry offerings consists of symbolic bracelets, necklaces, earrings and rings that act as a power source for women to wear and be reminded to always walk in their Goddess Truth. It’s more than jewelry, it’s a sacred lifestyle. I chose the eye symbol because it's widely recognized as a symbol of protection and guidance. I've always been interested in symbolism and ancient mythology from all cultures. Which is why I gravitate toward the Goddesses. These ancient stories connect us to something deeper in ourselves that help us get through different stages of our life. Wadjet (pronounced waed-jet) is the Egyptian Goddess known as the patron and protector of Lower Egypt, and later, upon unification with Upper Egypt, became the protector of all Egypt. She was often depicted as a snake with a woman's head. Wadjet is also the daughter of the Egyptian Sun God Ra. One day Wadjet and Ra were lost in the waters of Nun, so Ra sent Wadjet on a mission to find Tefnut (moisture) and Shu (air). When Wadjet returned successful Ra was so happy he honored Wadjet with being his "eye." I loved this story and it’s always stuck with me. When you add that to my love of the belief that we all posses a 6th sense, a third eye, I knew I wanted to use this eye symbol in my jewelry. I created the Wadjet Collection because I know how it feels to find a piece of jewelry that makes you look and feel great, like a Powerful Goddess Warrior! I feel I've captured that feeling with this collection. Wear these pieces of talismans to give yourself the protection and guidance that Wadjet can provide. 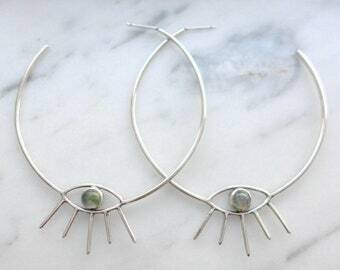 It is my hopes that when you wear a piece of Pineal Vision Jewelry you feel like the Powerful Goddess I know you are. Embrace your inner Goddess. Feel good about what you put on your temple. Buy Pineal Vision Jewelry. Hey! I'm the Owner/Jeweler/Designer at Pineal Vision Jewelry! I'm the one who designs/makes your jewels, photographs them, packages and ships them, answers your Etsy messages and everything in between. =) Nice to meet you! How Can I Care For My Silver Jewelry? It's best to store your silver jewelry in a zip-lock bag to aid in the progression of it tarnishing. To polish your silver jewelry you can use silver polish available at most hardware stores. These polishes can be quite poisonous so please do this in a well ventilated area or outside. Once dipped in the polishing solution rinse clean with water. Another, safer, solution is to use toothpaste or 1 parts baking soda and 2 parts water. Wet the silver and apply the cleaner with a soft, lint-free cloth or soft bristle toothbrush (not paper towels, which can scratch). Then rinse with cool water or buff with a soft cloth until dry. 1. Cut out a piece of paper that's about 1-2mm wide and about 3-4 inches in length. 2. Wrap that piece of paper around the widest part of you finger, usually the knuckle. Have someone help you if needed. Don't wrap too tight, just snug. 3. Mark where that paper overlaps and cut the excess. 4. Measure that piece of paper and send me the measurements. 5. Message me with your measurement. I will then check my own ring sizing tools to find out what that size is. Often times ring sizers are off by a few millimeters and by taking your measurements to my own tools it's the best way for 100% accuracy. Do You Wholesale To Retailers? Just go to PinealVisionJewelry.Faire.com to create a wholesale account.